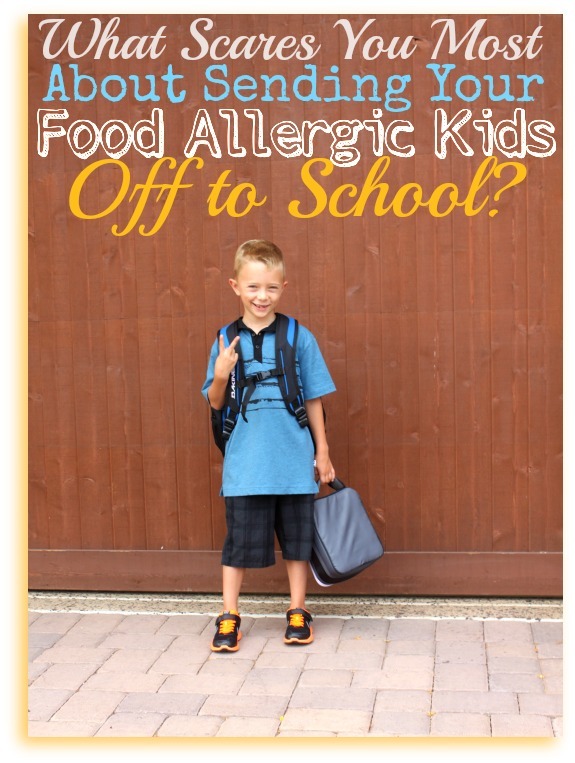 What Scares You Most About Sending Your Food Allergic Kids to School? Well…school is officially back in session for our crew…and many of you are already, or soon will be, following suit as well. And I know, based on the emails and calls I have been getting, and my own initial feelings this year, that this is the time that parents of children with food allergies start to have mini panic attacks. So many questions. So many things to worry about. What will I do about all of those food centered activities? How can I make sure that my child is not exposed to another child’s food? What can I do to make sure the teachers and administrators are totally aware? How can I make sure they are equipped to handle a reaction? These are just a few thoughts that have run through my head over the years, and definitely what many of you have been emailing me about. You have shared your Deepest Darkest Secrets. You have shared What Your Poisons (aka Your Food Allergies) are. Now I would love for you to share your concerns and fears about sending your food allergic children off to school this year in the comments below. Soon I will post some good coping tools and a game-plan to prevent you from having those mini anxiety attacks, but first I would like to hear what some of your biggest worries actually are. And hopefully, with some of the strategies and planning that I’ll share, you can feel a bit more confident as you send those kiddos out the door this year! One more thing… if you want to be included on my list to stay on top of what is going on in the food allergy community, please simply sign yourself up below…of course, only after you leave your comment. 😉 You will receive up-to-date information about the latest happenings in the food allergy world and discover strategies that will help you feel more in control of your special diets. I also have some exciting surprises coming soon. By signing up you will be among the first to hear about them. Note: By signing yourself up, you are agreeing that you would like to receive periodic updates from me personally, and be kept up to speed on special products and offers as they are available. Now…tell me about what scares you MOST about sending your kiddos off to school with their food allergies…then go sign up in the box above to make sure you don’t miss out on anything going on in the food allergy world. That is a definite concern, Alithea. I think it is probably one that most of us food allergy mamas are most worried about it. Thanks so much for sharing! What scares me most are those teachers and staff who THINK they know all they need to know about food allergies, and neglect to learn about MY SON’s food allergies and protocol specifically. Those are the hardest to talk to and open their minds. Skye, that is a good point. I think that once they get a little info on it they think they understand it all, not realizing that every single reaction in every single child could be totally different. Thanks for sharing! I was always scared that he would get really sick and besides for feeling bad that he would get sick in front of people and be mortified or be picked on after the fact. I also had a insensitive teacher who made me very nervous that she wouldn’t give him his safe options I kept there and make him go without when everyone else had “treats” He ended up getting VERY sick having nothing to do with his Celiac’s and the teacher handled it very badly. The school and superintendent then also failed to have anything be done about it so I took my kids out. I cyber school them now and would never go back…I just don’t think my school district is very safe or caring! Holly, that has always been a big concern of mine. I worry that he will get sick at school and then be very very embarrassed about it. Now that he is 8, he is getting far more aware of what other people think and he is now not as open about telling people he has Celiac Disease or food allergies. He would rather just tell them he is not hungry, instead of saying that whatever they are serving would make him viciously ill. I never want my babies to feel like they don’t fit in, or to get teased about it. That’s it, otherwise I’m not worried 🙂 No biggie, right. Hehe. Your babes are soooooo cute. Holy moly. How cute is their footwear? I am thankful and blessed that my kids’ school is very conscientious. It’s one of the local public charter schools. Every year, if a child in that particular crew (class) has an allergy, a bulletin goes home with all of the children to their parents. All of the children in the crew are told about it and what it can mean to their crew member. The school is not specifically peanut or tree nut free but we actually see very little peanut butter up there; it’s mostly almond, sunflower or soy. The school doesn’t serve the general school district lunch fare either. Last year it began going through a private catering service (peanut free kitchen) that prepares 90% of the food themselves that morning. They do buy bread from a baker, etc. They use as much local in season or organic produce as possible and the kids eat really well. They also offer a vegetarian option as well as a gluten free option (both of which come with a Greek yogurt fruit smoothie). Both of these options arrive at the school sealed in individually packed boxes. The lunch servers have to be current on all allergies so they know if a specific child can’t have something from that meal and they can either substitute something for it or mark they didn’t receive that item. All lunch help also have the number of the kitchen so they can call if they have a specific question about ingredients. The school is a candy/pop free zone and the parents have been asked, if they must bring a treat in (such as for a birthday) to make it as healthy as possible and to make sure all allergies are taken into account. It’s never fun for anyone to sit out while everyone else gets a yummy treat. The very first year the school was open, one of the teachers sent a mom home with all of her treats because she hadn’t actually bothered to read the allergy bulletin (she told the teacher that it’s all hype and there aren’t so many allergies in the world >.<) and the teachers continue to do so. It's so frustrating when friends or family, or doctors or school officials (from the school my oldest son was in before this charter opened) look at you like you have two heads when you say this is what's happening with my child, this is what I've observed and this is the decision I've made to help my child. I also don't understand how people can honestly think that sensitivities and allergies aren't that common and that a child won't die from, say, eating a peanut. There is so much information out there but people seem to be missing it. Hi Ami!! Your school sounds a lot like the charter school we go to, as well, down to how they do lunches. Of course, not many of their options are gluten free so I still pack our lunches. But it is so nice to hear of more schools being more and more aware! I have to agree at how frustrating it is to hear from people who just do not really believe that this increase in food allergies and sensitivities is real. I want to shove the scientific research and proof in their faces and ask them what exactly is there that they don’t believe. Thank you so much for coming and sharing your story here. I am so glad to hear that your kids get to experience a school that takes such good precautions! We don’t have any true food allergies just sensitivities. We stay away from dairy and gluten. My son is 3 and recently started preschool where they supply all the snacks and lunches for the kids, but I spoke to the managers and his teachers about my concerns. They were very open to having me send all his food so that’s what I do. They celebrate birthdays as well which made me nervous, but I keep a “special” treat for him at the school which they know to give to him. So far so good!!! Would still love to hear your suggestions though. Kelly, I do the exact same thing as you. I keep snacks and treats at school in a container for each of my kids. That way, whenever food is being served in the class room they can go and choose something from their container. I let them choose what we are going to put in it too, because then they feel like it is more of a special treat! I don’t have any kiddos with food allergies, but two of my very best friends do! It is so hard and I can’t imagine how scary it is to send them to school!!! As a side note, I am a speech therapist in the schools and I want to make sure all of you are not forgetting to educated the peripheral staff (therapist, librarian, special education teachers, art, gym, etc) on your child’s allergy and how to deal with it! While I whole heartily feel the principals should be educating the entire school, I have learned via my friends that just is NOT happening. Please don’t forgot to tell anyone your child spends extended time with about his/her allergies. Even if you just hand them a piece of paper with your child’s picture, explain the allergy, explain signs of reaction, and explain what to do! I know I would really appreciate that as a therapist! I am so glad to be reading this right now. 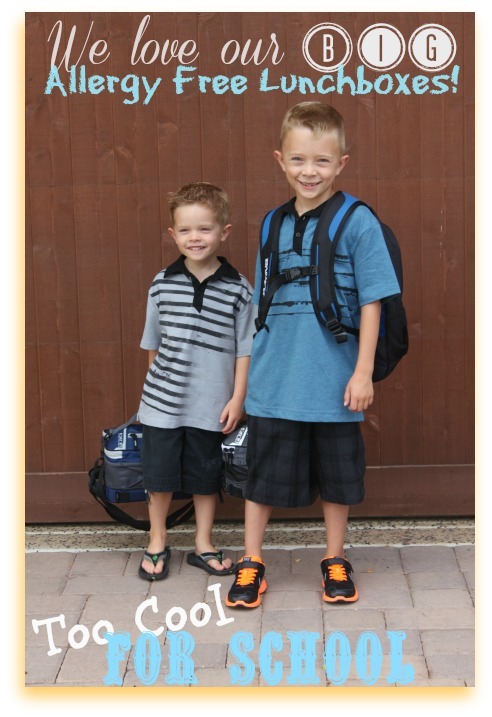 Today was our first day of school and of our six kiddos, three of them have Celiac Disease/gluten issues. My 3rd grader was diagnosed last year, so we have been in these waters before. My 4th and 5th grader were newly diagnosed a few weeks ago. We didn’t even suspect they had it, but we had to screen them because of their sister. Turns out they had it all along and never showed major symptoms. All that to say, I feel like I constantly have a megaphone tied around my neck telling each and every teacher, switch teacher, and administrator about Celiac Disease. It seems that everytime I mention it, all I can hear are cricket sounds as they try to register what gluten free means. I spent the last two days getting canisters, two per child, to fill with gluten free treats for each classroom they are in. Then, I labeled them in a “supercool” way for each one. After that, I wrote a letter to go with the jar. I spent last week writing up a note to each teacher and switch teacher introducing them to Celiac Disease and my children in general that I will also be sending to the principal so she is aware of the situation and how many GF kids she now has in her school. My kids don’t have immediate, visible reactions if they come across gluten, but as a mom, I do get concerned that they will feel left out and different when those inevitable social situations come up. Around our house, we refer to GF eating as the Olympian training plan. We say they’re eating like athletes. We even looked up Olympian GF’ers and tried to look for them during the games. I know one of them won a gold medal in swimming. I feel much less isolated reading all of these other mom comments and am very thankful I came across this post. Thank you!! Hi Polly! Your story sounds exactly like mine. You are doing everything right. The containers to keep at school, the notes, the letters, educating the teachers… You should be proud of your great game plan. And I love your idea of telling your kids that it is the Olympian Training Plan! That is brilliant! More and more athletes are going the route of the gluten free diet regardless of whether they have Celiac Disease or gluten sensitivities. I am so glad you were able to feel like you are not so alone in this by coming here and reading so many of the other families that are going through similar things. And keep up the good work! Your children are blessed to have you as their advocate! I love the “I don’t want to miss out” and cute pic of you! The boys look adorable! Nothing to add to this conversation, but excellent that you are covering the topic Kim! What scares me the most about sending my son to school is LUNCH PERIOD. He is on a gluten/dairy/milk free diet but feels isolated during lunch because he is made to sit alone and other kids think his food choices are ‘weired”. My daughter is entering kindergarten in two weeks. Up until now I have been spoiled. Her preschool and the parents running it were so understanding and amazingly supportive. They banned all of her allergy food from snack times and school gatherings. They have even gone as far as accommodating her at birthday parties! Like I said, amazing and spoiled. I’m now terrified with her entering a new school, not knowing anyone, we wont have the same support. There seems to be so much food in classrooms. She is allergic to dairy, nuts and eggs. She will have a reaction if someone touches cheese or nuts then touches her, so if it has been on tables she could be affected. I have gone over her allergies with her, she knows to ask before she eats anything or not to eat anything that isn’t from me directly. She knows to stay away from children eating peanut butter or cheese or cheese flavored chips. I just hope and pray that she actually follows through. I worry that her meds will be kept in the classroom and not in the nurse’s office on the other side of the school. Even with the awesome support of our previous school, she still had a reaction at one birthday party. They had cheetos, I have grown to loath powdered cheese flavored anything. That said. I have to trust her and trust the school. I have been teaching her about her allergies and her health since we found out at 10 months old. She is smart. And I happen to live in an area that seems to be very smart and supportive of dietary issues. I just hope the public school system we are in is equally supportive. If not I’m ready to go to battle (so to speak). My youngest is also entering preschool this fall. So, I get to train a whole new class of moms (it’s co-op preschool) about the seriousness of allergies. The bright side, It will be a whole class of moms educated about food allergies. To help her!! . My son has already brought peanut products home from class! He has friends in there with allergys. I don’t see how that is safe and it make me scared for my daughter!! Not ready for this!